Comcept's 2D action game launches todays for PC and consoles for $19.99 and also at retail (except for 360/PS3 versions) for $29.99 which include an art book, double-sided poster plus both DLC packs Ray and Retro Hero. We got the game last week. Played it once, haven't had the courage to capture it yet... I think it says it all. Kickstarting games doesn't stand a chance at being viable in the future if they swindle backers money like this. But also, for all the failures that Kickstarter has produced, let's try to remember the good stuff as well. Mainly old school PC RPGs i suppoose, but still. Oh boy, this failed big time, isn't it? They should have hired few students, who are into the indie development. They would have make so much better product for as low as 10-15% of that $4 millions budged. btw inb4 the inevitable argument ''hur-durr $4mln are nothing for a modern videogame development''. Don't know what this was supposed to be. 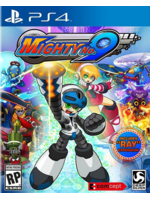 Looks like a re-branded Megaman. Wow, just looked at the Kickstarter and this is worse than I thought. What happened?